Here is a photo tutorial on how I made finished the quilt by setting in the circles. subtract 1″ from the measurement of the inset circle so this will be 6 1/2″ and cut our using a circular ruler. fold the cut out circle in half and mark those 8ths. showing the markings at the 8ths with blue chalk. Showing the marking of the center circle. place the center circle under the top background right sides up. Sew 1/4 inch on the background side adjust the material as you sew around by manipulate the fabric so that you have a flat edge with no wrinkles where your going to sew. Finished circle pressed to the inside to make it look like the circle is above the background. I quilted this quilt using circular rulersand echoed the circles to make it look like ripples in the water. Each of my critters are quilted with echoe quilting. Heres the finished quilt. 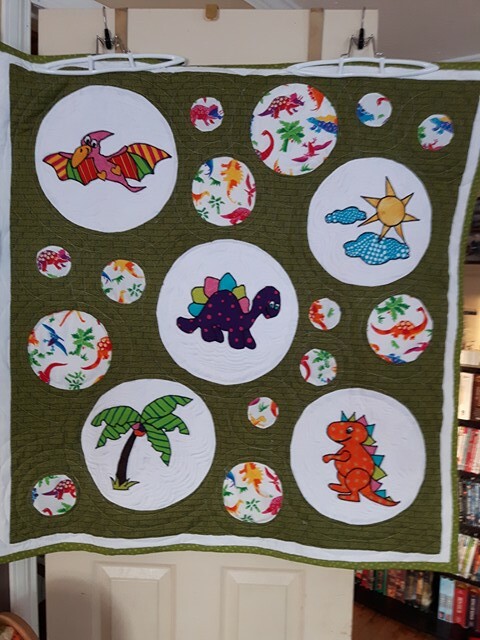 Ready for display at our Quilt show in March. Hope to see some of you. Next Hayden… my 1st collage.